Are you one of the" Northerners" that suffers every time the temp drops down low because the pathetic output of your Samurai heater ? Well, the fix is EASY! 1. Vacuum cleaner with hose. Smaller diameter hose is needed 1.5" or so. 2. Drill and hole saw. The hole saw should be slightly bigger than the vacuum cleaner hose. 3. Something to plug the hole you create. I used 2 washers, and a toggle bolt with screw. All from Home Depot for $1.18. you can opt for a plastic plug or just good ol' duct tape. First, you should remove the panel directly under the steering wheel. This gives you room to maneuver the drill around. 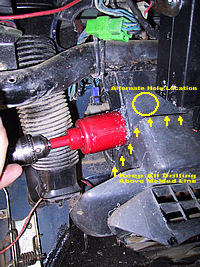 Once that is done, pull out the flexible hose from the driver's side of the airbox and tuck it up out of the way. 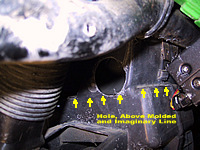 If you take and draw an imaginary line from the step in the front of the airbox to the curve in the rear, that will be the highest possible point for the heater core. 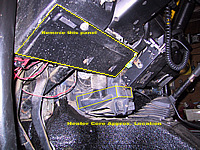 Another view, just make sure all drilling is kept above the molded line on the heater box. If there is no line on yours (very possible) you can draw one there, or just eye-ball it. 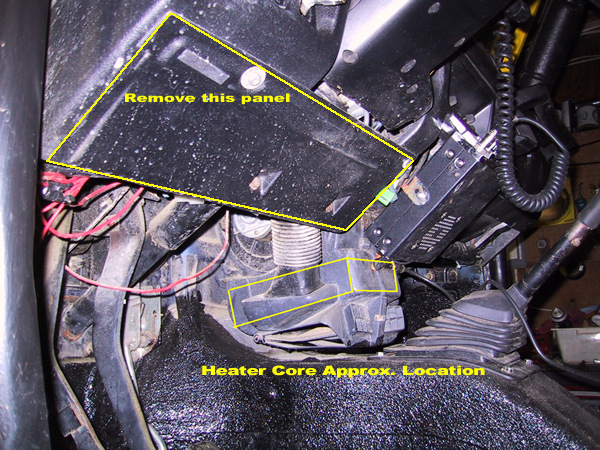 Be VERY CAREFUL to not go below this area or you will be forced to replace the heater core. 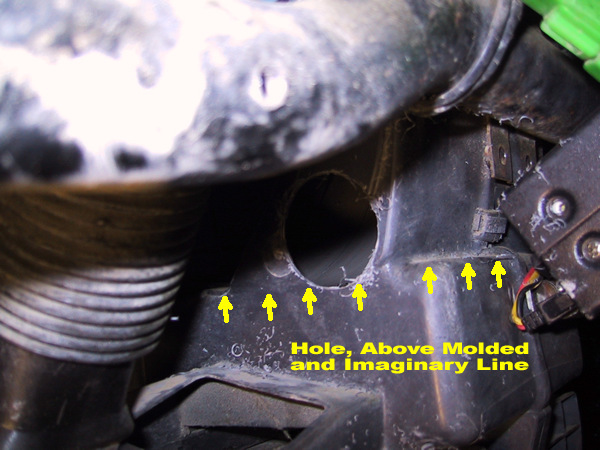 Once you've got the area figured out, take your hole saw and carefully punch a hole in the side of the airbox. 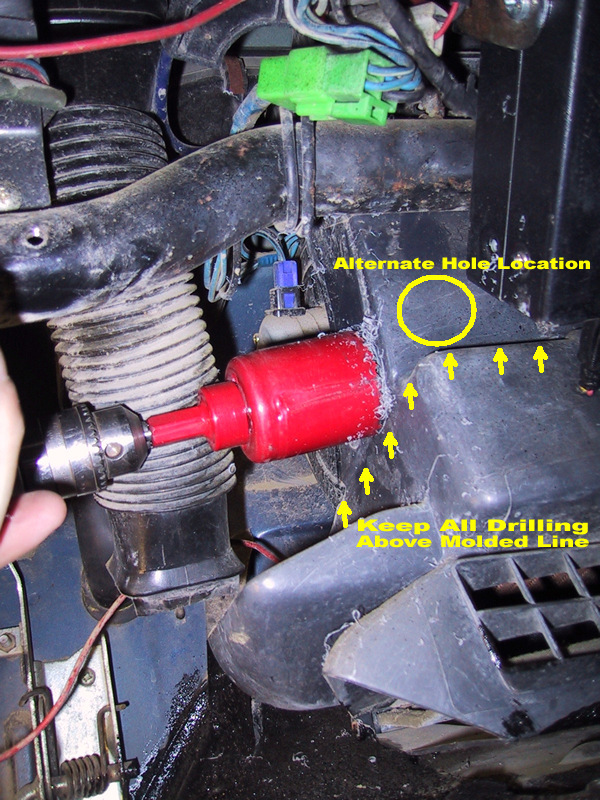 You could drill the hole in the front of the airbox instead if you don't have enough room for you drill under the dash. The end result will be the same. So, take the wife's vacuum cleaner out to the garage and get all that junk off the heater core. 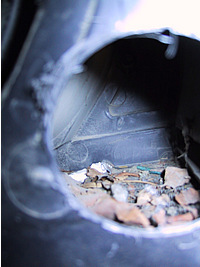 Be very careful with the surface of the core itself, it can be damaged by rubbing it, just like a radiator. All we need to do now is fill the hole created. 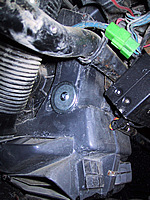 I chose to use a toggle bolt and washer as shown. Other options are a plastic plug, rubber stopper, or duct tape. Put a dab of silicone on the washers to seal the hole best. Here's the finished project. A little black paint on the washers and nobody will ever know. The whole project, including taking these pics and searching for tools, took under 30 minutes. Now, for the real test, let the truck warm up and turn on the blower... nice... Not only is the air *hot*, but also a lot better flow!